We all have those chores where it is easier to continue with the, work-around, than it is to take the time to fix it properly. I finally became tired of pumping up the wheelbarrow’s tire every time I needed to use it. Nothing else got done that afternoon because fixing the tire did take the 2.5 hrs that I thought it would. Now I can get on with moving the wood, from the fallen Ash tree, from the back lawn to the side yard. Three days ago it was -9 C and this morning it is +10 C, what season is it anyway? 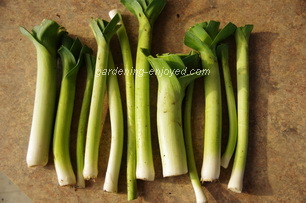 The warming weather softened the soil enough that I could easily harvest the Leeks. There is now a large bag of this wonderful vegetable that we will be enjoying for the next few weeks. I will also spend an afternoon and make a large batch of Leek soup which will be frozen in serving sized portions to be enjoyed throughout the winter. Mother Nature continues to fascinate me. The long row of Leeks were all spaced the same, all received the same rainfall and fertilizer and yet they vary in size from pencil thin to 3 cm+. They all taste wonderful so maybe I should just stop asking so many unanswerable questions. My Christmas reading has been arriving almost every day. Seed catalogues in all their glory have started to arrive. The economy must be improving because they all seem to be much thicker this year. Or maybe the economy is worse so more people are growing their own vegetables and flowers to save money. Could some economist do a learned treatise on this phenomenon, probably supported by a government grant? Where will I find room to try all of the new varieties. 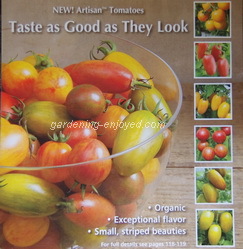 Johnny’s catalogue is showcasing eight new artisan Tomatoes and making it easy for those of us with limited space by selling a package of all types for only $14.95. I only want 2 plants of each variety and this looks like something that’s definitely going on my list. The big question; which varieties that I usually grow will have to surrender their space? I’m sure I will discover dozens more “must have” things by the time I’m finished leafing through all of these catalogues. It’s a glorious way to spend the short dark days of early winter. I have two Cactus that bloom magnificently, one on either side of the Solarium. The pictured one is in full bloom as I write this and the other blooms reliably by Christmas. They are both species of Schlumbergera spp and are commonly called Thanksgiving Cactus and Christmas Cactus obviously for their blooming time. The Thanksgiving Cactus Schlumbergera truncata cvs is patently an American because the blooms are nowhere in sight on the Canadian Thanksgiving. 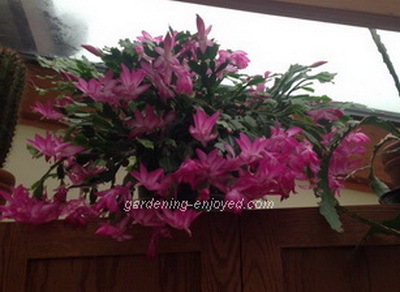 My Christmas Cactus Schlumbergera russelliana cvs has bloomed at the appropriate time for several years. Both of these delights are easy to care for and provide a great show of colour as winter gets deeper. Mine are both part time houseplants summering outside in the shade. They get rather heavily pruned when they move out in late May. Their bloom cycle is photoperiodic, that is, they bloom under the influence of the shortened days at this time of year. If they are kept in a room where there is a reasonable amount of artificial light after the sun goes down then they may not bloom. Sofie Asks? I have a question please regarding fertilizing. I have brought in many annuals including hibiscus, coleus, and geraniums that are actively growing and blooming, plus other tropicals that are growing but not blooming. It is Nov. 29th. Should I be fertilizing these plants because they are blooming and growing. The advice has always been not to fertilize until end of March - so I never know quite what to do. If so, what type of fertilizer should I use? Also, when should one cut back tropical hibiscus? My hibiscus (I have several) always bloom during the winter after I bring them indoors in the fall and barely bloom in summer when they are outside. Very annoying. Does it have anything to do with the time of pruning? Ken Answers! It is confusing. The "don't fertilize" is usually meant for your foliage house plants because they are doing nothing until spring. My Hibiscus blooms reliably until about February and I don't fertilize it. Late February or early March is when I prune it and then fertilize it and it is usually starting to bloom when it goes outside. The things that are blooming I might give a light dose of fertilizer and use something that is low in N as they probably aren't going to grow that much but you want them to keep blooming if possible. Even in the summer the Hibiscus gets a low N fertilizer so that it blooms instead of growing lots of green leaves. Hope that helps, gardening is always an adventure. Carol Asks? Is there any advantage to using distilled water from my dehumidifier to water houseplants? Ken Answers! Water from your dehumidifier will have eliminated most of the Chlorine and Fluorine that is added to municipal water. That is a good thing as many houseplants suffer some damage from their presence. Water from a water softener is not good for plants because of the higher sodium levels.